Oops – I accidentally just posted an entry I was drafting (Want Zion without the crowds?). Still getting the hang of this after a year. So if you have signed up to receive our posts by e-mail, you can ignore that last e-mail you got. You’ll see that post again later, and it will actually have some text! Apologies! However, that does give me a chance to tell you about a little contest we’re running to try and increase our Facebook fans. Go to our Facebook page and like it (it’s just A Week or a Weekend) and then SHARE the post that has the real entry for this week – Hiking A-Z: Our Anniversary in Zion. If you’re already a fan, just share the entry. You have to like the page and share the post to be entered. We’ll draw one winner Friday from all the people who’ve liked and shared. Winner receives a Zion waterbottle and some bumbleberry seeds. What’s a bumbleberry you ask? Tune in to the blog next week to find out! Thanks, all! Enjoy your week or your weekend! 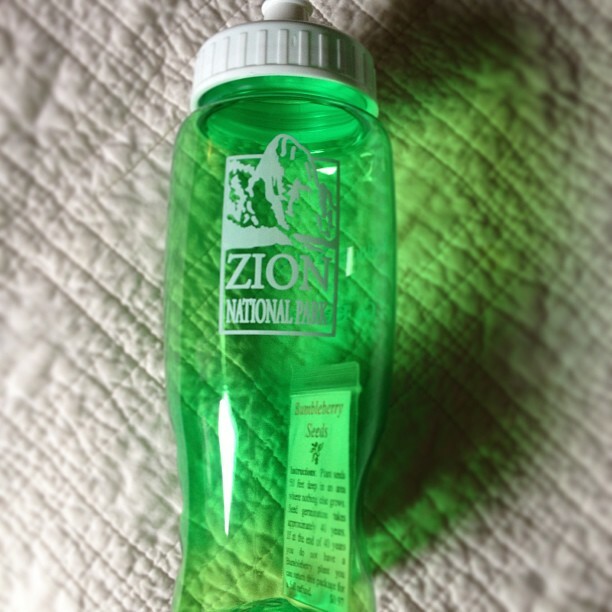 Zion waterbottle and bumbleberry seeds for one lucky winner!